Pregnant at 16, Renee Goodchild drops out of school and marries. Now she's trapped in rural Texas with Kenny, her violent, garbage-collecting husband. A bleak future seems assured until she meets self-appointed relationship guru, Pearly. "That's why you don't let 'em rule the roost. 'Cause you can't count on 'em to be there the next mornin' when it's time to crow," the worldly Pearly advises. Renee narrates this tale of ruin and redemption where the damaged and downtrodden lead each other to unintended, sometimes heartbreaking, and often bittersweet outcomes. When Horses Had Wings examines the lives of broken people competing for the most basic needs: the primal urge for affection and the eternal search for acceptance. Diana Estill is the author of three humor books, one novel, and a collection of short stories. For Deedee Divine's Totally Skewed Guide to Life, she was named a ForeWord Book of the Year Finalist and an International Book Awards Winner in the humor category. Prior to becoming an author, Diana worked for many years as a journalist and humor columnist. Her columns have appeared in The Dallas Morning News, Washington Post, The Miami Herald, Road & Travel, and other publications. She has been featured in First Magazine and has appeared on a variety of TV shows and radio programs. 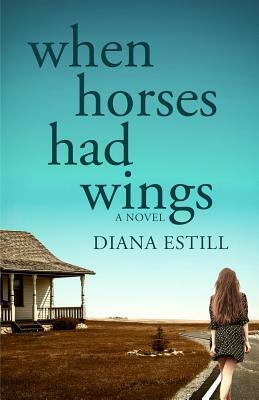 Diana's debut novel, When Horses Had Wings, was inspired by her life experiences as a former teen mother and high school dropout. After completing her education, she taught GED classes, worked as a consultant to the National Institute for Literacy and American Council on Education, and served as a U.S. delegate to a UNESCO education conference.